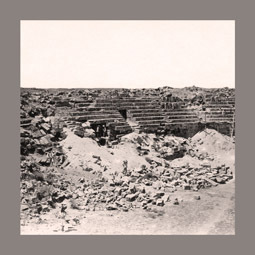 The Amphitheatre of Sabratha, ignored by 18th and 19th century explorers, was described for the first time by Henri Méhier de Mathuisieulx in 1912 and investigated by Renato Bartoccini beginning in 1924. His work brought to light a large part of the monument, but it was not published. Recently, new research and excavations have made possible new topographical and architectonic drawings of the building, as well as new analysis. The Amphitheatre was completely constructed from local calcarenite blocks in the middle of the II Century A.D. and lies inside an ancient mine at the east boundary of the old site. Contrary to current opinion, it was completed as demonstrated by two blocks of the crowning cornice with holes for the poles of the velarium. The unit of measure used is the Punic cubit, and it is also possible to recognize the geometrical design of the project. Up to 20.000 spectators could be seated in its cavea, a very large number, given the population of the old town. This venue was capable of hosting large numbers of visitors who had come to Sabratha for the great feasts connected with a market that featured caravans of products transported from central Africa, including ivory, gold, animals and slaves. Spectators were able to see sumptuous munera such us that ones offered by G. Flavius Pudens (IRT, 117). The Amphitheatre may have been damaged by an earthquake during the 4th Century, after that it was abandoned and almost totally spoiled during the 6th Century.